I have just put Lillian for morning nap and I should be working out right now. So there is no shredding today. Today there is cereal, a laptop and a second cup of coffee. 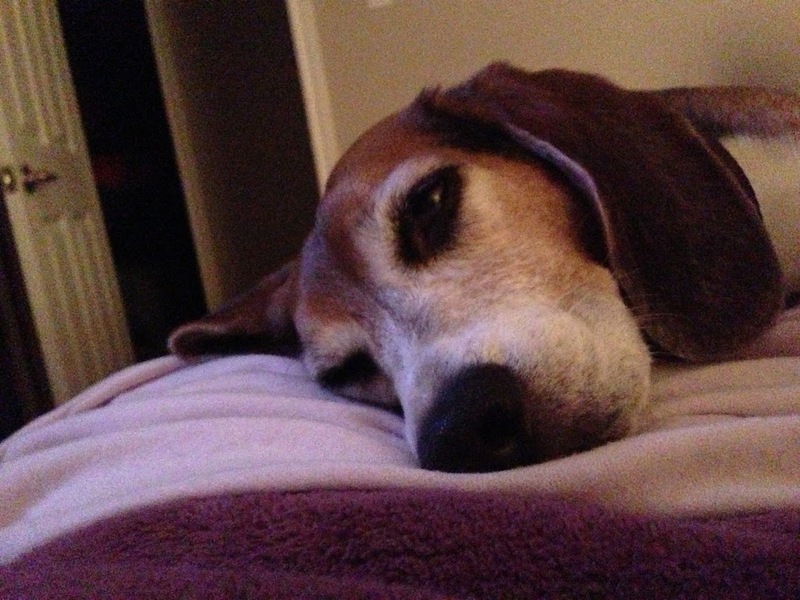 I have to take the Beag to the vet today for the third time in two months. First time he had a bad reaction to a flea medication, then it was time for his yearly checkup and now… ugh. He has been complaining of shoulder pain for a while now. See, here is the problem with Charlie, he is a spaz. A huge spaz. He is so much of a spaz that the time he threw out his neck in early 2012 it took me the entire morning to become convinced the pain was for real. He caught his nail on the carpet once and screamed so loud I thought there was pile of blood somewhere with his name on it. Nope. His nail just hurt. We live our lives with a dog with no pain tolerance, he is the dog that cried ouch and that makes him hard to believe…ever. 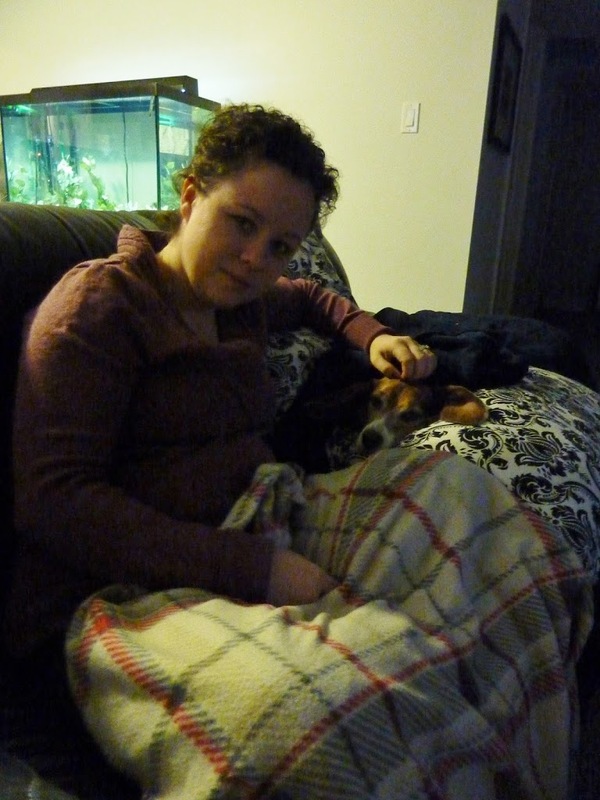 Propped into a comfortable position with pillows and lots of muscle relaxants – January 2012. Pregnant with Lil and did not know yet. Case and point when he started complaining of the current shoulder pain we did not believe him. It seemed so intermittent, we could not pin point exactly what the issue was. He would get off the sofa and yelp once or twice. He seemed to be having a harder time climbing the stairs (they are pretty steep) and seemed to be more cautious as to how to move. On Saturday Matthew was working. He works the odd weekend and this was the first one in a while. Of course we had a showing on Saturday and an open house on Sunday for the house sale so it was going to be a busy one. Friday into Saturday night Lillian woke up six time, goodness knows why. I suspect her teeth but the reason really didn’t matter at 4 am when she was just UP and refusing to sleep. So on Saturday I had a house to prep for a showing at 11 am, a tired cranky baby that was refusing to nap (that helps cleaning) and had to figure out something to do with us plus Charlie for an hour during the showing. I packed up Charlie and Lillian and figured we would take a walk. I thought the walk would rock her to sleep and Sir Charles and I could enjoy the sun and breeze a while. We headed out and got 3 blocks away when all the sudden Charlie started walking quite slowly. Charlie is always right beside me, keeping pace with the stroller. I thought he was just being difficult so I urged him along. He slowed down even more. And even more. All the sudden he gets down on his belly and crawls along the ground, lets out a little yelp and refuses to go any further. Lillian had just fallen asleep and woke up with a start, screaming. Charlie is on the ground whimpering and I am on the side of one of our town’s busiest streets stranded. I cannot turn around and go home because I cannot be there for the showing. I cannot keep walking because something is quite wrong with the Beag. I am well and truly stuck. I got down on my hands and knees and begin to slowly work out his shoulder joints. I rub them attempt to loosen them up and provide him some comfort. All the while shaking the stroller with my foot to soothe Lillian who is just DONE with giant crocodile tears rolling down her overtired face. Without warning Charlie slowly stands up and begins to walk back home. I follow him and we very slowly walk one block to a local school yard that is a block from home. I tied him up to some play yard equipment in the shade and did laps of the school yard with Lillian trying to get her to go back to sleep. And we stay there for an hour. Lillian does not go back to sleep. Charlie enjoys his quiet time in the shade but it becomes apparent we need to do something to help the old guy out. I never want to see my pets suffer and I want him to have the best quality of life possible. Let us be honest, that hasn’t be easy with Charlie. Our Beag is a bit of a lemon. He has thrown out his neck, had a seizure, broken out in random hives once a year each year of his life and we still cannot find the cause. He has separation anxiety. He licks his paws incessantly and the vets have no reason why, he has given himself poisoning once, routinely has bad reactions to medications and gets sick from any pharmaceuticals we give him… he is a mess. But he is our mess and we just want what is best for him.